The PDC’s inaugural European Tour event provided many highlights for some of MODUS’ top stars, including James Wade’s run to the final and a Simon Whitlock nine-darter in the Austrian Darts Open. Wade, who had seen off Kim Huybrechts on Sunday afternoon, also beat Wes Newton and Dave Chisnall before eventually succumbing to Pipe in the final, in which ‘The Machine’ hit a ten-darter. The world number three takes home £7500 in prize money as runner up, along with a confidence boosting run ahead of his McCoy’s Premier League showdown with Phil Taylor on Thursday. Raymond van Barneveld also enjoyed a good run in Austria. The Dutchman reached the semi-finals, where he produced a sensational 170 checkout, only to be denied by Pipe. ‘Barney’ had beaten Welsh pair Mark Webster and Richie Burnett on his way to the last four. His attention also turns to Birmingham, where he faces Gary Anderson in the Premier League on Thursday. Simon Whitlock provided one of the best moments of the weekend when he produced a perfect nine-dart leg in his last 32 defeat to Joe Cullen. ‘The Wizard’ goes into his Premier League match at the NIA, needing just a point against Andy Hamilton to secure a semi-final spot. Michael van Gerwen posted two ton-plus averages before being edged out by a single leg in the last 16, while Webster grabbed two wins, including a 6-0 whitewash in round two, before being stopped by ‘Barney’. Credit must also go to young Arron Monk for running van Barneveld close in their first round match. 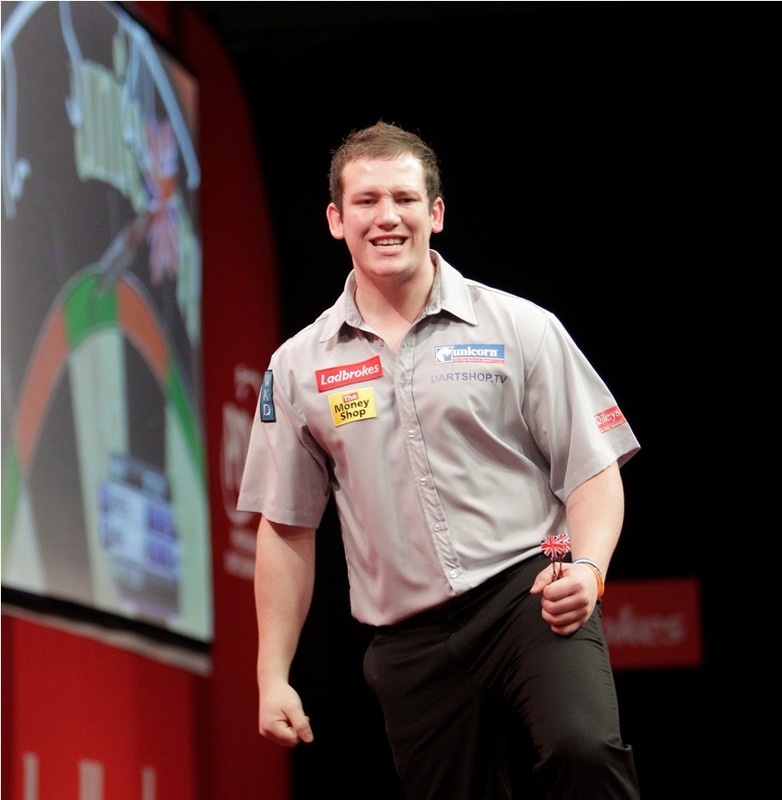 The 2011 PDC under-21 World Champion was narrowly beaten 6-4 by the Dutch darting legend. Raymond van Barneveld and James Wade both booked their places in the quarter-finals of the PDC’s inaugural European Tour event, with third round victories on Sunday afternoon. ‘Barney’ posted an impressive 102.47 average in a 6-2 triumph over Mark Webster in the Austrian Darts Open, while Wade swept past Kim Huybrechts 6-1. But Youth World Championship finalist Michael van Gerwen was edged out 6-5 by James Richardson. Van Barneveld raced into a three leg lead, hitting a 121 finish in the third, to take control against Webster. The left-hander, from Wales, checked out 71 in one of the two legs he won, but a rampant ‘Barney’ went on to set up a quarter-final clash with another Welshman, Richie Burnett. Wade faces Wes Newton in the last eight on Sunday evening, after ‘The Machine’ claimed a commanding victory over Kim Huybrechts. The world number three hit two 180’s and a one-hundred checkout in his success over the much-fancied Belgian. 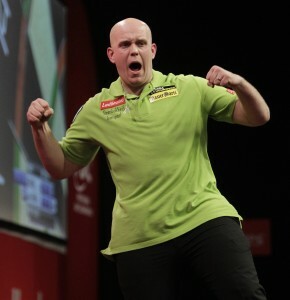 Van Gerwen hit an impressive eleven 140’s in his match against Richardson but lost out in a last leg decider. Joe Cullen, Justin Pipe and Dave Chisnall complete Sunday evening’s quarter-final line-up, with the semi-finals and final taking place immediately after at the Arena Nova. Michael van Gerwen and Mark Webster were the top performers on day two of the Austrian Darts Open in Wiener Neustadt, while Simon Whitlock was denied victory despite hitting a fabulous nine-dart finish. James Wade and Raymond van Barneveld also progressed into the last 16 of the PDC’s first European Tour Event on Saturday. Whitlock produced the highlight of the day with his sensational perfect leg, hitting two maximums before finishing 141 with treble 20, treble 15, and double 18. But ‘The Wizard’ lost out to emerging young talent Joe Cullen. Youth World finalist Michael van Gerwen posted the highest average of the day, beating Friday’s top performer Colin Lloyd with a superb 104.7, in a victory that took less than fifteen minutes to complete. ‘Mighty Mike’ faces James Richardson in round three on Sunday afternoon. Webster also stormed through to the third round as he whitewashed Alan Tabern 6-0. The Welshman’s win sets up a tasty all-MODUS affair with Raymond van Barneveld in the last 16, after ‘Barney’ saw off the challenge of Colin Osborne. 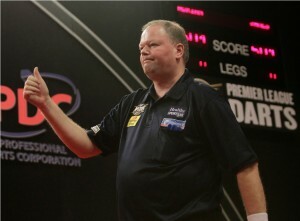 “Colin played well and deserved to be ahead but I’m pleased with how I played,” said van Barneveld. Wade beat Steve Beaton 6-4 to set up a clash with Kim Huybrechts, who triumphed over Vincent van der Voort, while Co Stompe was eliminated by Gary Anderson. Play on Sunday sees the third round played in the afternoon session before the quarter-finals, semi-finals and final take place in the evening at the Arena Nova, with the finalist claiming a £15,000 first prize. Seven MODUS stars made it through to round two of the PDC’s inaugural European Tour event with victories in the Austrian Darts Open on Friday. James Wade, Raymond van Barneveld, Simon Whitlock, Mark Webster, Vincent van der Voort, Co Stompe and Michael van Gerwen all won their respective first round matches at the Arena Nova in Wiener Neustadt. World number three Wade hit fabulous finishes of 160 and 142 in his 6-3 triumph over Prakash Jiwa, while Whitlock beat Mareno Michels 6-4. Legendary Dutchman van Barneveld edged past promising youngster Arron Monk with a 6-4 victory, while his compatriot van der Voort defeated Darren Webster 6-3. Van Gerwen averaged over 100 in his 6-4 success over Mervyn King, and fellow Dutchman Co Stompe beat Ross Smith 6-3, while Webster beat Jelle Klaasen by the same score, but Paul Nicholson suffered an early exit at the hands of Dean Winstanley. The second round pairs Webster against Alan Tabern in the afternoon session, when van der Voort is also back in action. ‘The Dutch Destroyer’ faces Kim Huybrechts. MODUS’ Premier League trio all take to the stage in the evening session; with Wade facing Steve Beaton before ‘Barney’ and Whitlock take on Colin Osborne and Joe Cullen respectively. The evening session will also see Stompe go head to head with Gary Anderson, while van Gerwen runs into the top performer of round one, when he faces Colin Lloyd, who posted an impressive average of 111. James Wade and Raymond van Barneveld are still strong contenders for McCoy’s Premier League Play-Off places, after the pair both earned draws at Liverpool’s Echo Arena. 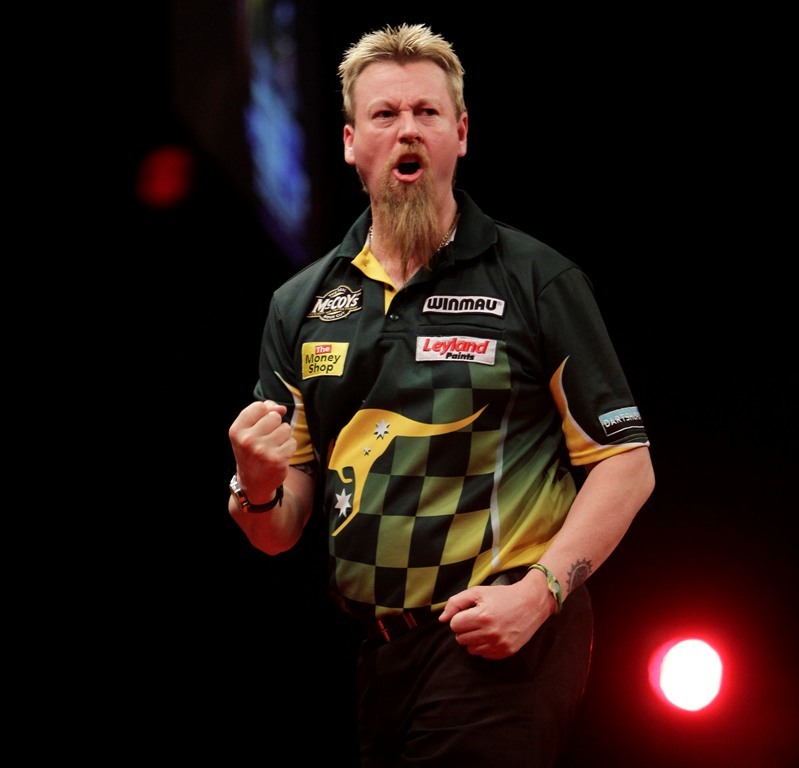 Results on night twelve meant that Simon Whitlock moved within a whisker of qualification for finals night despite suffering defeat, as all of the other games were drawn. Wade showed real fighting spirit in the night’s opening match, as he came back from three legs down twice to share the spoils with Kevin Painter. ‘The Machine’, who trailed ‘The Artist’ 4-1 and 7-4, won the last three legs to take his points tally to twelve, keeping himself in third place. Whitlock then gave Phil ‘The Power’ Taylor and early scare in their top of the table clash. ‘The Wizard’ raced into a 3-1 lead, which included a sensational 161 checkout, but the league leader won all of the remaining legs. 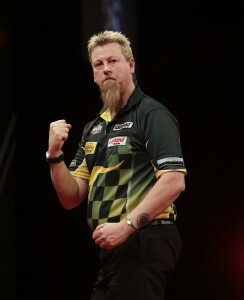 Whitlock remains in second place behind Taylor, who has already booked his place at London’s O2 Arena in May. The Australian ace needs just one more point from his remaining two matches to ensure he joins his opponent. ‘Barney’ battled hard for a precious point against Andy Hamilton after ‘The Hammer’ had led 4-1. The Dutchman missed two darts to win the match, but was pleased to get the draw, which leaves him a point and a place outside the Play-Off spots. Reigning champion Gary Anderson held World Champion Adrian Lewis to a draw in the evening’s final match. That result leaves Lewis in the mix for a semi-final place but ends Anderson’s hopes of retaining his title. Whitlock can seal qualification with a result against Hamilton in Birmingham next week. Wade is up against Taylor at the NIA, while van Barneveld faces Anderson. Raymond van Barneveld kept himself firmly in the hunt for a McCoy’s Premier League semi-final spot with a draw against Andy Hamilton in Liverpool. The five-time World Champion fought his way back from 4-1 down to grab a point, although it could have been an even better comeback for ‘Barney’, who missed two darts at a match-winning double. He said: “Andy is a fantastic player, every time I play him he makes it hard for me to win. I didn’t play my best tonight so I was happy to get a draw. Hamilton won the first three legs, taking out a brilliant 152 finish in the second, before ‘Barney’ got a leg on the board when he hit double ten. ‘The Hammer’ hit double top to take a 4-1 lead but van Barneveld cut his lead in half with a tidy 76 checkout. The Dutchman hit double 16 for a crucial break of throw. He then held his own throw to draw level, before just missing the second treble on a 164 finish. Hamilton capitalised and edged back in front before ‘Barney’ replied by hitting his first 180 on the way to squaring up at five legs apiece. Hamilton held again before van Barneveld did the same, hitting double top for a neat 82 finish under pressure. ‘Barney’ put himself in a good position to win the match by hitting a 180 against the throw, but was made to pay for two missed darts at double twelve, as Hamilton guaranteed himself a point. Van Barneveld made sure he claimed a share of the spoils by hitting double top. James Wade came back from three legs down twice to seal a draw against Kevin Painter at Liverpool’s Echo Arena. Wade, who hit four maximums, trailed Painter 4-1 and 7-4 but fought back to move onto twelve points in the McCoy’s Premier League, staying in strong contention for a Play-Off place. ‘The Machine’ hit his first 180 on the way to taking the opening leg. Painter held his throw in the second leg and then grabbed an early break with a 120 checkout. ‘The Artist’ made it 3-1 and Wade looked like he had the ideal response, hitting his second maximum, followed by a 140, but Painter produced a superb eleven darter to grab another break of throw. Wade clinched a crucial break back before the break, going out in twelve darts to reduce the deficit to 4-2. He returned after the interval with his third 180 and went on to hit double 18 to move within a leg of his opponent. Painter restored his two leg advantage when he took out 68 but ‘The Machine’ bounced back again, taking out 123 brilliantly on the bull. ‘The Artist’ hit double top with his first attempt to win the tenth leg, and then produced a stunning ten darter to move 7-4 ahead. Needing to win all of the remaining three legs to have any chance of salvaging a draw, Wade hammered home his fourth maximum before finishing on 83 for a break of throw. ‘The Machine’ then held his throw to put the pressure on Painter. The 2009 winner hit back to back 140’s in the final leg, before hitting double top to take a share of the spoils. Simon Whitlock could seal his place in the McCoy’s Premier League Play-Offs on Thursday, if he can get a positive result against Phil Taylor, in a top of the table clash at Liverpool’s Echo Arena. Whitlock is second in the table with 14 points after claiming three successive victories. If ‘The Wizard’ manages to extend his excellent run of form with a win against Taylor, who has already qualified for the semi-finals, he would guarantee his place at London’s O2 Arena in May. He said: “I’m not satisfied with my points total just yet. 14 might be enough to make the Play-Offs in the end, but I want another two or four points out of the last three matches. Raymond van Barneveld and James Wade are also hoping to boost their chances of reaching the final four. 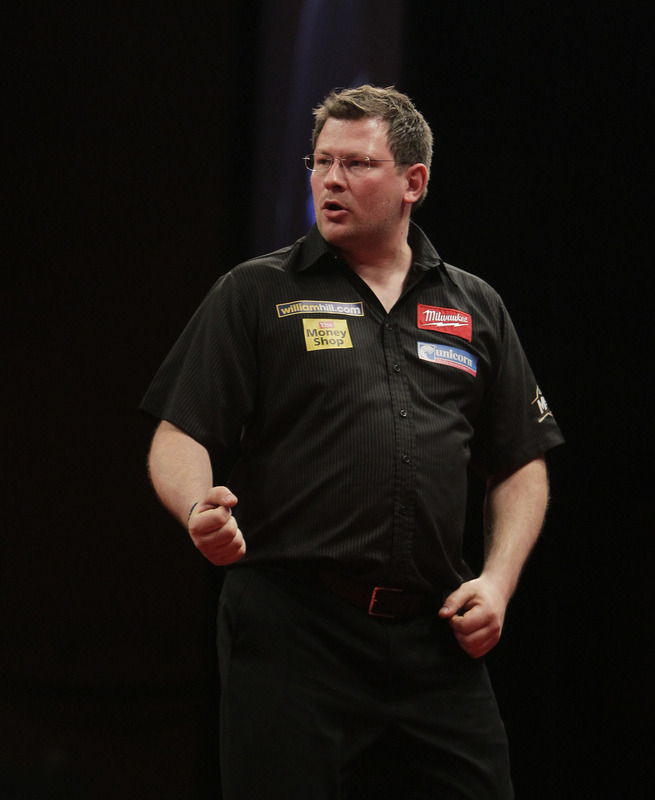 ‘Barney’ is looking to catapult himself back into the top four when he faces Andy Hamilton. The Dutchman is fifth with ten points, while ‘The Hammer’ must get a result to stay in contention. 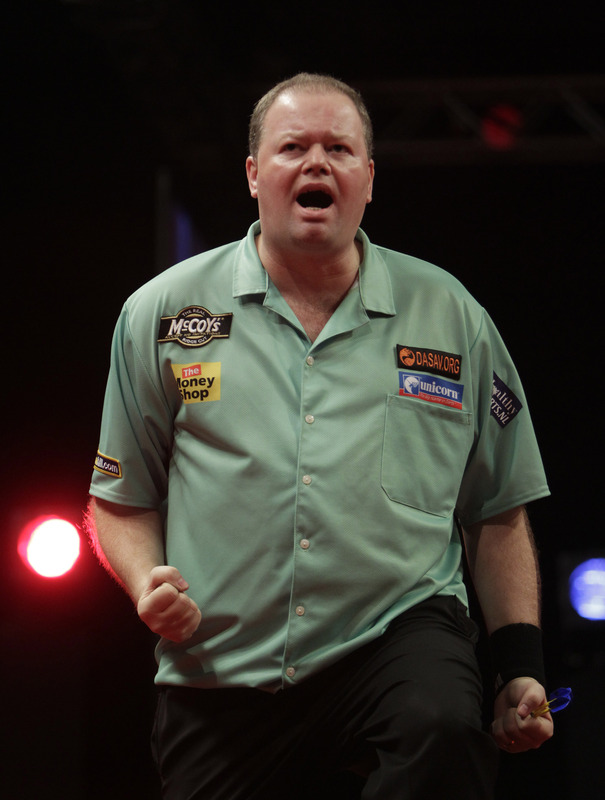 Van Barneveld, who was beaten by Whitlock last week, knows he has an important night ahead. “Last week’s result doesn’t change anything for me,” said ‘Barney’. “Even if I’d won I think I had to win in Liverpool and also another game after that so I’ll try to do my best against Andy. Wade, who is third in the table, can move onto 13 points if he beats Kevin Painter. ‘The Artist’ needs to avoid defeat to keep his Play-Off hopes alive. In the night’s other match, Adrian Lewis, who sits in fourth place, takes on reigning champion Gary Anderson, who must win to hang on to any hopes of retaining his title. Arron Monk claimed a brilliant double at the weekend, with victories in the PDC Unicorn Youth Tour Event’s one and three at the Moorways centre in Derby. The 2011 Under-21 World Champion whitewashed both James Hubbard and Michael Smith, who won the second event, in final triumphs on consecutive days. Monk, who plays Raymond van Barneveld in the inaugural European Tour Event in Austria next weekend, collected over £1000 in prize money for his excellent efforts. “Last year was frustrating for me. I had a bad patch and was changing my darts and trying to improve my game, and it just didn’t happen for me on the Youth Tour. “I’ve been practising for a while now with a different throw, where my darts flick up more in the board instead of laying flat, but I’ve never had the guts to try it in tournaments before this weekend. Monk’s route to glory in Saturday’s Event one included victories over Aubrey and Smith before overcoming Hubbard 4-0 in the final with a commanding performance, in which he produced a stunning 150 checkout. After reaching the last 16 in Event two, Monk returned on Sunday to win Event three, beating Co Stompe Jnr and Jamie Lewis amongst others, before another 4-0 victory in the final. Simon Whitlock tightened his grip on a McCoy’s Premier League play-off place after claiming his third successive victory, with an 8-4 triumph over Raymond van Barneveld, while James Wade remains firmly in the hunt for a semi-final spot after sharing the spoils with Andy Hamilton in Bournemouth. Whitlock moved onto 14 points after getting the better of ‘Barney’, who won back to back tournaments at the weekend. Whitlock sits in second place, three points ahead of James Wade, who earned a hard fought point against Hamilton. ‘The Machine’ hit four 180’s and took out finishes of 116 and 114, but was matched all the way by ‘The Hammer’. Adrian Lewis joined Wade on eleven points and moved into the top four, after inflicting Phil Taylor’s first defeat of the season, while Kevin Painter kept his semi-final hopes alive, with a win over Gary Anderson. Van Barneveld’s defeat against Whitlock meant the Dutchman dropped out of the play-off places, but he is still in strong contention and just a point behind Lewis and Wade. ‘Barney’ will be aiming to make a return to the top half when he faces Hamilton in Liverpool next Thursday. Wade takes on Painter at the Echo Arena, while Whitlock, who faces ‘The Power’, could officially seal qualification.